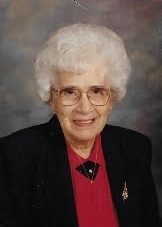 Margaret (Weinzetl) Fonder, of Sioux Falls, SD passed away September 22, 2017. Margaret was born on July 17, 1922 to parents George and Alvina Weinzetl. Margaret spent her younger years on a farm near Currie. As a young teen, Margaret was a self-taught accordion player. She and her siblings, Agnes and Jerry, formed a popular band called “Margies Trio”, which played at numerous town halls in and around Currie, MN. On October 15, 1945 Margaret wed Hugh (Mel) Fonder Jr. They lived most of their years in the Sioux Falls North End. For more than 50 years, Margaret was an active Catholic Daughters member. For more than 30 years, she was a hard-working and dedicated employee at the Holiday Inn. She was a tender and humble servant who worked hard in order for her children to attend catholic schools. Margaret was a gentle soul; she loved seeing her great-grandchildren and was a dedicated servant to her Lord. We have fond memories of her famous homemade rolls and sugar cookies. Margaret is survived by her children: Richard (Jan), Roger (Lynda), Ronald (Corri), Julie (Dan) Majeske; her sisters: Therese Dardis, Fideles Shea, and Dolores (Norbert) Dardis; numerous grandchildren survive Margaret. Margaret was preceded in death by her husband: Mel; her son: Robert; her daughter: Joanne; her grandson: Mike (son of Joyce & Ron Fonder); her daughter-in-law: Diane Fonder; her parents: Alvina and George; and her siblings: Gerald, Wally, John, Agnes, Larry and Vincent. Please join us for a visitation at Barnett-Lewis Funeral Home on Tuesday September 26, starting at 6:00 PM with a Scripture Vigil at 7:00 PM followed by a Catholic Daughters of the Americas Rosary. Margaret’s Mass of Christian Burial will take place at the Cathedral of St. Joseph at 10:00 AM, Wednesday September 27. In lieu of flowers, please donate to Catholic Daughters Of The Americas – Sioux Falls, SD or the Alzheimer's Association.